I've hinted quite a bit here (and here and here and here) about how much my girls love the series of books about Charlotte and Martha, Laura Ingalls' ancestors, written by Melissa Wiley. Mary Rose is especially enamored with them and reads them over and over (and over and over). It leads to quite interesting conversation at times as she daily asks if my clothing is made of wool or cotton or flax and things like that. Just yesterday she was explaining to me how we could cook up some of the roots of the hyacinths we planted to use as a poultice to cure our boils. Not that we have any boils at present, but you know, just in case. The most startling conversation was when she solemnly inquired if I had my funeral garments already prepared because, after all, that is a wife's first duty. 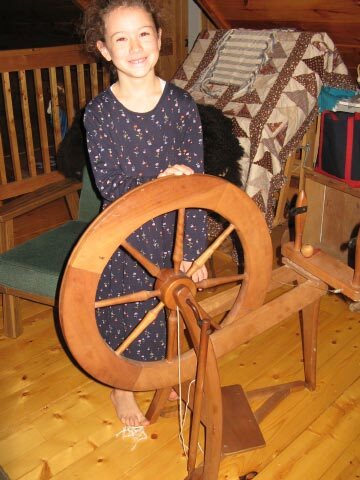 Mary Rose so loves to be Martha that she was hoping to get a spinning wheel for Christmas, and that would satisfy her until she could also get a loom when she is a bit older. In an effort to make it clear that she wasn't getting a spinning wheel I got her a drop spindle as a little gift in November. As you can see, she was thrilled! I knew to have the camera ready ahead of time for when she opened it. 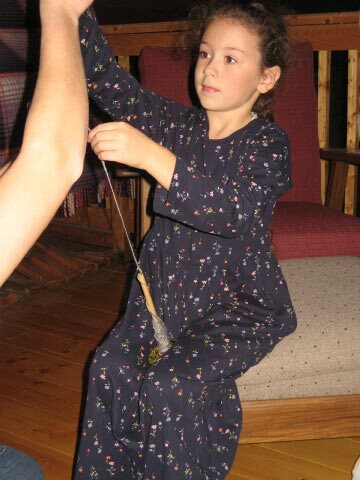 (It was also fun to have Dad ask, 'Um, what's a drop spindle?' Mary Rose was happy to enlighten him.) 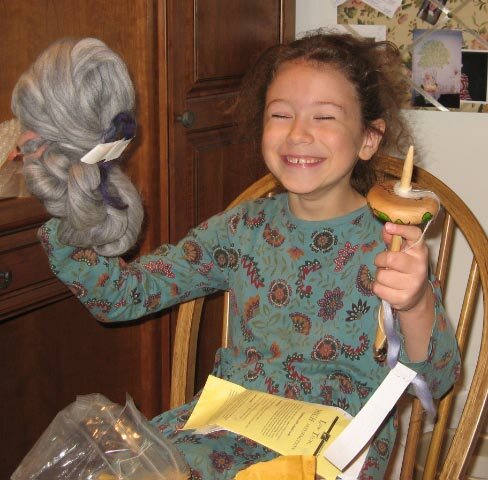 I purchased a handmade drop spindle that came with instructions and some wool roving for getting started. 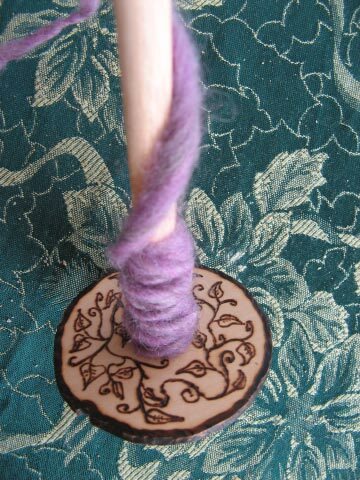 Ours is a bottom whorl spindle, and you can easily find them on Etsy or eBay. 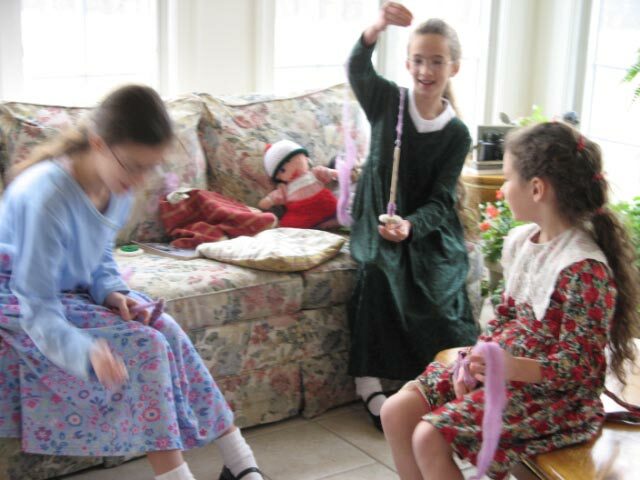 It is also very simple to make your own spindle; find directions here at The Joy of Handspinning site. They also have a video demonstration you can watch for learning to spin. 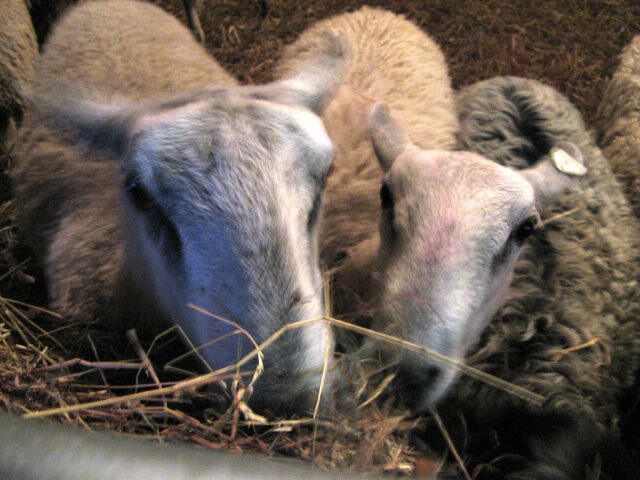 It was fun to visit the sheep in person as we so enjoy A New Coat for Anna and A Symphony for the Sheep. Mary Rose was delighted to examine their collection of spinning wheels. 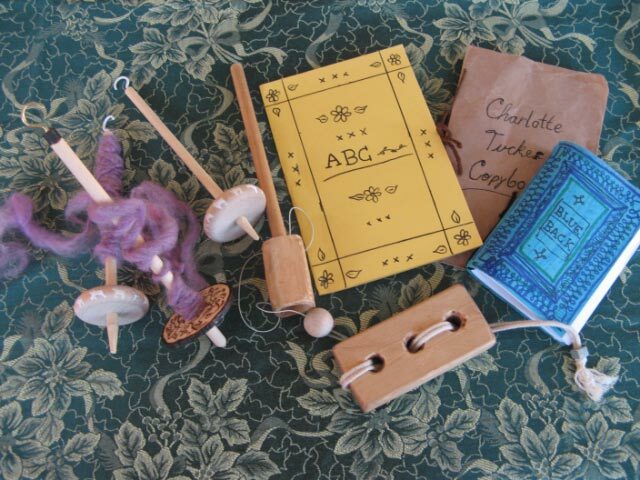 And our friend kindly gave Mary Rose some instruction in using the drop spindle. 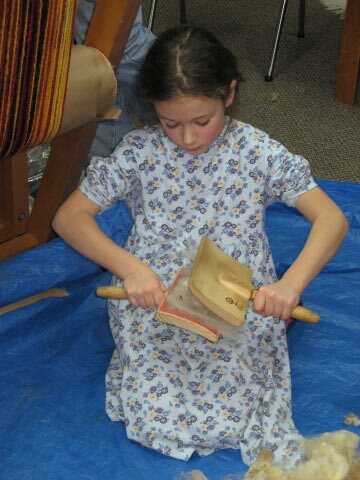 She also had the opportunity to try her hand at carding the wool. 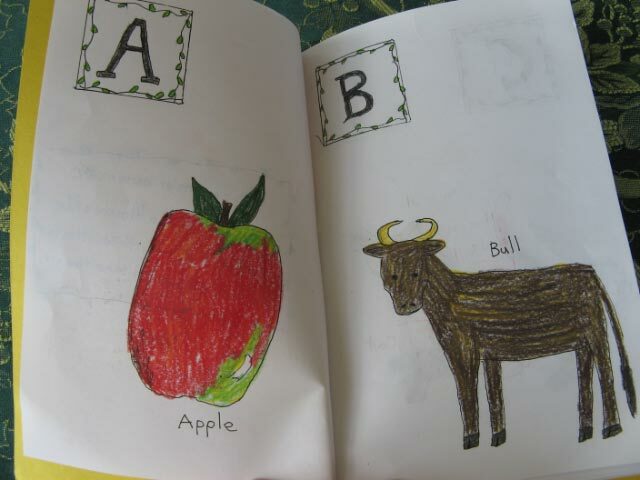 Mary Rose was just thrilled to experience all of this firsthand after reading all about it so often in her beloved books. For Christmas, Lydia thoughtfully made some gifts for Mary Rose to go along with her love of all things Martha (Morse, not Stewart!) and Charlotte. Lydia is very creative and clever at thinking up gifts that she knows will delight the recipient. 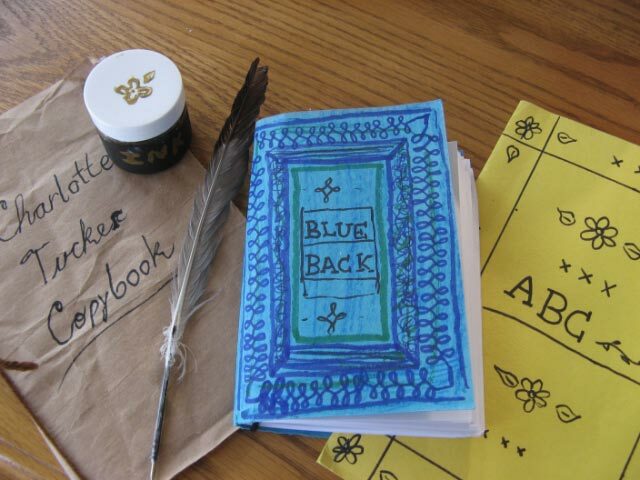 Here we have Charlotte Tucker's Copybook, a quill and pretend jar of ink, the Blue Back Speller and an ABC book. 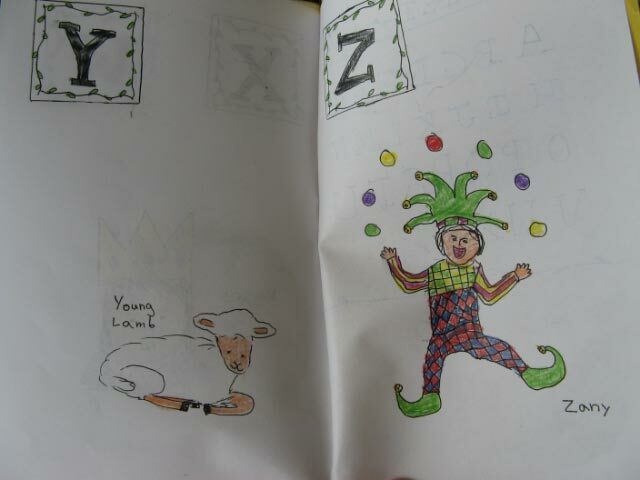 ...to young lamb and zany. 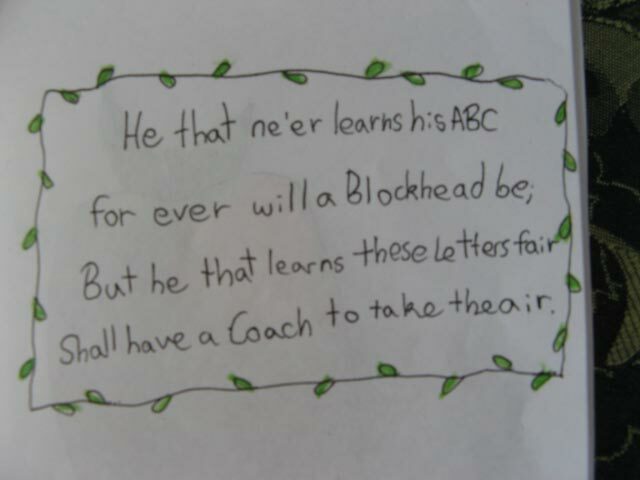 We don't have to worry about any 'blockheads' here! The children like to do all of their Christmas crafting independently and we have a regular 'house full of secrets' like Laura did. But Jonathan and Josiah were thinking along the same lines as Lydia. Jonathan carved some wood to make some reproductions of classic historical toys - the cinch knot puzzle and a catch-the-ball-in-the-cup gadget seen below. Josiah made a drop spindle for Anna Ruth and one for Lydia, and Jonathan made one for me! Josiah painted cute tiny sheep around the edges of his. Jonathan decorated mine with pretty woodburned leaves and vines. Now the girls can all spin together! This collection of Scottish folk songs is so lively and engaging we all just love it. The little girls dance and the boys play along on their folk instruments and the parents carry on with quite a bounce and skip in their step whenever this CD is on, which is often as 'elbow room' is one of Eliza's top requests. 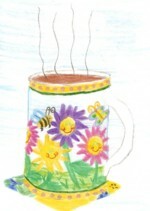 You can preview the songs on the Amazon site to see if this music is your cup of tea. Enjoy!